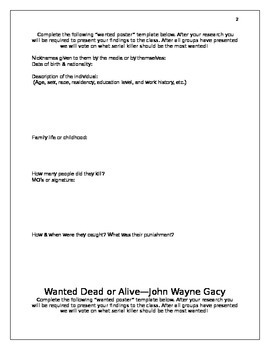 This activity template is made to look like a wanted poster. 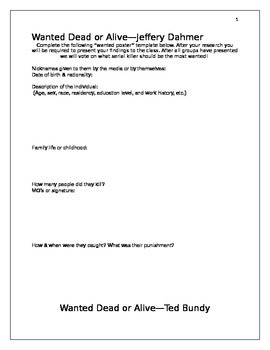 For this assignment I included seven different wanted posters each assigned with a famous serial killer from United States History. 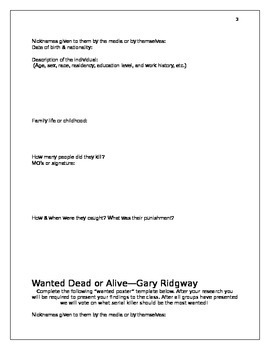 The wanted poster asks students to research information about the serial killer such as nicknames given to them by the media or themselves, brief description of the individual such as their race, education level, family life and childhood, their MO or signature, how they were caught, punishment, etc. I split my class into seven different groups and had each group complete one of the "wanted posters". After their research I then had them present their findings to the class. 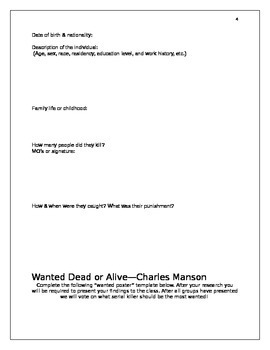 After all of the groups presented, students can then vote on what serial killer should be the "most wanted".